The back garden as I found it, then as I left it. It’s amazing what 18 months and a little effort can do! Our western concept of a good garden is all straight lines and trimmed edges, military order imposed over nature. My garden was never going to work like that, with its narrow, sloping beds, limited space and inherited perennials. Early attempts at organised growing largely led to failure, so I learnt to work with the patchy conditions, scattering seed and learning from the successes and failures just which patch was good for growing what. Making use of limited space I mixed herbs and flowers with the veggies, attracting pollinators and repelling pests. My small patch became amazingly productive and I grew to love the wildness of it. My garden taught me to respect nature and work with the conditions I find myself in. As part of challenging myself to live more sustainably I wanted to minimise the bought-in inputs to the garden, saving money as well natural resources. Instead of buying solutions I tried to make do with what I had. From the junk previous tenants had left behind I built my bed edges, staked the tomatoes and made climbing frames for the beans. Cardboard from my moving boxes and newspapers collected from my office became weed matting and compost carbon. I mixed up experimental mulch from coffee grounds mixed with pulled weeds, raked up leaves and a little ash from the wood heater. Everything I could find a use for was reused: broken cups, kitchen scraps, laddered stockings, pickings from the neighbour’s tip pile. I learnt that life can flourish on the cheap, and to really think before throwing something away. When I moved into the Cottage the garden was over-run with weeds and I swore to remove them. Then I read a little more about permaculture and re-considered. Some weeds really did have to go, like the invasive mirror-bush and ivy, but the rest I learnt to work with and even value. Tap-rooted weeds opened up the badly compacted soil of my “lawn”, letting the grass then re-colonise bare patches. Dandelion, nettle and feral fennel found use in my kitchen. Weedy blue borage brought in the bees and nasturtiums colonised and shaded the driest beds, letting me plant underneath. Pulled weeds became green manure, a free source of nutrients to feed back into the earth. Problems became solutions and life found balance. Gardeners learn to live with heartbreak. You pour time and love and hard labour into growing things, then a gale will destroy your greenhouse and the seedlings within; bushfire weather will scorch tender greens to a crisp; rats will eat your lettuces; blackbirds will dig up all your baby brassicas. The weather can wreak havoc and all you can do is wait until the storm/heat-wave/cold-snap/dry-spell/wet-spell is over, make the best of what survives and start over with everything else. From each disaster you learn: how to prepare better, how to plan for disaster, and how to brush the next one off and keep going, to keep on growing. There will be more gardens in my future, but even here in the city concrete I can use the lessons from my garden to help myself to flourish. What has your garden taught you? The front garden, 18 months on. I hope one day another gardener builds on the work I’ve done. I still hate dandelions, but if you get the leaves nice and fresh they do make good salad and soup leaves. They also work well flash fried in olive oil with garlic, pepper, salt and dried chili flakes. Why do you hate them? The tap roots break up clay soils, and can also help shallow-rooting plants like tomatos sick their roots a little deeper. After a night of boozing I rather crave a breakfast of quickly sauteed dandelion leaves with eggs, mushrooms or smoked tofu. I think my tastebuds know the bitter compounds are good for me. Nice to see the pictures of your old garden… I had forgotten what a challenge it was! I’m not sure how you cope with the high-rise concrete, but I’m sure that all those other fantastic experiences are some compensation! My garden has taught me patience! I too had forgotten just how bad the garden was when I moved in. I remember venting to a gardener friend about all the work required and she tols me to stop complaining because I love a good challenge, and she was totally right. Lima wears me down. I cope by knowing it’s temporary and by getting out of the city as often as possible. Truthfully though I don’t have time for gardening here, which makes it a little easier. It’s a shame you don’t have time for gardening there, it would be fascinating to read your journey. I had a balcony garden in Melbourne – two of them, I was lucky enough to have space on both sides. The things you can do on a balcony are surprisingly broad. I made planting boxes out of the big styrofoam boxes used to transport fruit and vegies, schlepped way too much dirt up the stairs… but it was worth it. If I had a balcony I’m certain I’d have a few pots of herbs out there by now. I kept balcony gardens for 7 years, including compsting. I’m looking forward to starting a new garden when I eventually get back home (or find somewhere else that feels like home). Hi Toni! Loved your post! So true and what a beautiful transformation you did with your garden. We have just moved back to Melbourne, hoping to stay put for a while, so I am planning to transform our little sandy soil garden here. Have planted some flowers in the front and about to lay down sone straw, newspaper and manure for a no dig garden out the back. You’ve inspired me to take some before photos for future comparisons. Can’t believe you’re in Peru! 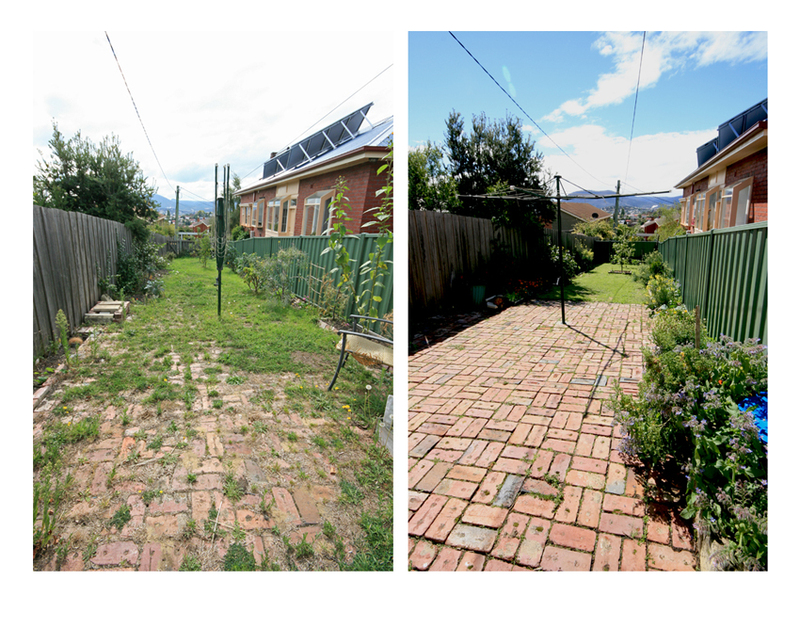 A great post to get me in the mood to tackle the land for this years planting; before and afters are a great reminder of your achievements. I hope you manage to escape the concrete jungle soon. Thanks Eddy. I’m in Lima until the end of October (1/3 through my year here now), then I’m off adventuring in the mountains for a while. After that I have no idea what happens next.